Show us the Knew Knit Kit! OK so the newbie this week is *drumroll please! * The Beginners Boatneck Jumper Knit Kit. It’s been a loooooong time in the making (I’m so sorry to everyone who’s been waiting months!) but it’s finally here as a knit kit (from £50) and a pattern (for £7.) It’s currently on Pre-Order while I wait for the printing to arrive but it should be ANY day now (yippee) so they’ll be leaving very soon! LAD’s Top Tip: I recommend going for a darker colour on the body and a lighter colour on the sleeves. If I was to choose I’d select my favourite two colours and make sure they’ll go nicely together - for this I’d suggest either colours that are tonal or contrasting - last year when I introduced the Cushion kit I did a blog and included some images and information about mixing colours that might be helpful, Show Me! Once I’d chosen my two colours I’d figure out which is darker (normally obvious but sometimes if you go for two bold colours it’s hard to tell in which case I’d say they’re about even) and order the darker one as Colour 1 (for the main body) and the lighter as Colour 2 (for the sleeves) …There’s just something about the balance of it. 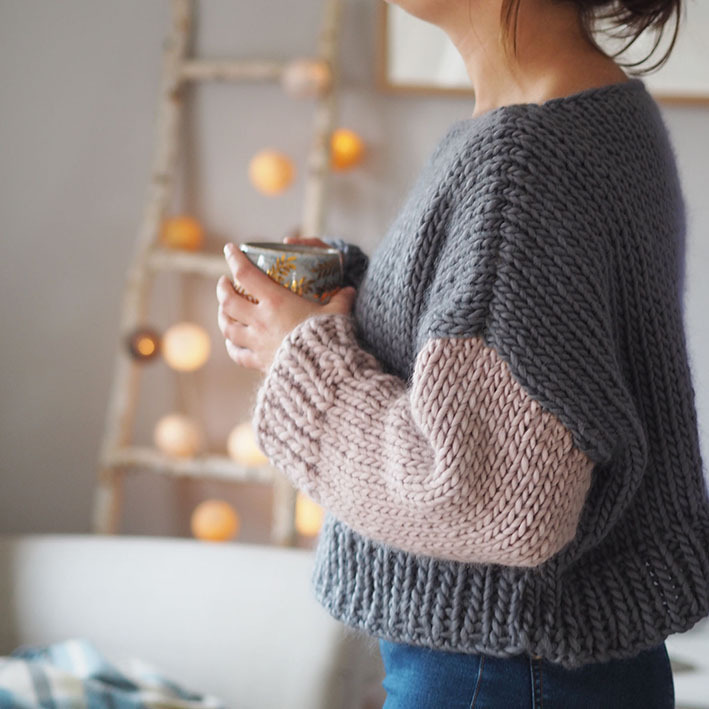 Having darker sleeves and a light body can seem a little off….having said that - if you do it the other way round I bet it would look fabulous and I’d be happy to be proved wrong so do let me know! The Boatneck jumper looks incredible with a shirt underneath (and the collar out - I also like to do up my collar and wear a necklace underneath - like you would a bowtie) It looks GORGEOUS under dungarees, fab with a skirt - especially the Off the shoulder neckline with a pencil skirt and of course it’s so easy to wear with jeans and I can’t resist a culotte. When you’re choosing your colours it’s good to think how and when you might wear it as that can have a bearing on the colours you go for, for instance - I would wear my granite and mustard boatneck casually with jeans and dungarees, if I wanted to wear it with skirts, culottes and kind of ‘out’ more then I’d go for tonal greys, Pink and Candyfloss or maybe Emerald and Mid Grey - just based on my style and other clothes I could wear it with. OK I’ve gone on for long enough now, you get it - it’s a jumper, it’s for beginners, GREEEEAT. I’ll leave you with the links below in case you want to investigate further. Hope you’re having a magical week, I’m off to work on a new Toolkit (Define your Audience, it’s a bloody good one!) and then I’m starting to pack the Subscription boxes! We’ve been sent so many treats by wonderful small businesses so all of the subscription boxes will not only be filled with yarn but also a mx of greetings cards, foodie treats, prints, keyrings and MORE! It’s incredible! I’ll fill you in soon, THANKS TEAM! I want the Knit Kit! Urm... I want a subscription box! Is there anything you want a blog on? business, personal, style, knitting ...anything I'm all ears!